Tag line: "Nature has a dark side"
Steeped in Irish folklore, The Hallow is an intensely engrossing creature feature. But more than anything, this 2015 movie is proof-positive that, even in the computer age, there’s still plenty of room for practical effects. Hired by a logging company to survey a lush Irish forest, Adam (Joseph Mawle), along with his wife Clare (Bojana Novakovic) and their infant son Finn (Wren Hardy), takes up residence in a remote cottage on the edge of the woods. 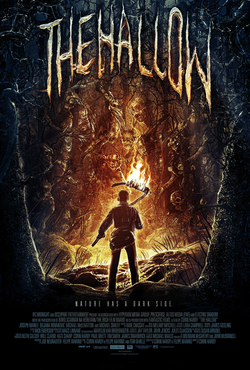 Despite some local opposition, as well as a cryptic warning from their nearest neighbor Colm Donnelly (Michael McElhatton) to stay out of the forest, Adam carries on with his work, and while doing so discovers the woods are home to an unusual fungal-based parasite, one so strong it can control the mind of anyone it infects. But as the young family will soon realize, the forest harbors even greater dangers, and while common sense might tell them that ancient folklore is the stuff of fantasy, some fairy tales should be taken very seriously. The opening scenes of The Hallow, which include Adam’s survey of the forest and his exploration of an abandoned house in the middle of the woods, are beautifully handled by cinematographer Martijn Van Broekhuizen, and establish just how isolated Adam and his family are from the rest of the world. As for its story, writer / director Colin Hardy sets it up wonderfully at the outset; along with Adam’s discovery of the parasitic fungus, the young couple learns that Donnelly’s adolescent daughter Cora vanished in the woods years earlier, and he is convinced she was taken by the forest’s creatures (Changelings, Fairies, Banshees, etc.). The second half of The Hallow is more action-oriented, and takes place over the course of a single night, when Adam and Clare figure out for themselves that Donnelly’s “monsters” are not only real, but also trying to kidnap their infant son, Finn! At this point, the ominous tone that director Hardy had been building in the films first half becomes all-encompassing, reaching a fever pitch as Adam and Clare fight to keep their child safe from the onslaught. Yet, for me, the film’s most noteworthy accomplishment is that its various monsters were created (for the most part) via practical effects. Drawing inspiration from Ray Harryhausen as well as the horror films of the ‘70s and ‘80s (Alien, The Thing, Evil Dead II), Colin Hardy relied heavily on practical effects throughout The Hallow, and the skillful work done by his team brought the creatures convincingly to life. In addition, this approach helped make the entire movie more powerful (and more frightening) than it might otherwise have been (using practical instead of CGI allowed the actors to physically interact with the monsters, bringing an intensity to the performances that might have been lost had the characters and creatures been spliced together on a computer screen). This, along with a few interesting plot twists (including one that calls Adam’s sanity into question) and even a healthy dose of body horror, makes The Hallow one hell of an effective monster flick, not to mention a movie that every fan of practical effects should stand up and applaud. This looks pretty good. I'll be checking it out for sure.